A TransientThermalResults object contains the temperature and gradients values in a form convenient for plotting and postprocessing. The temperature and its gradient are calculated at the nodes of the triangular or tetrahedral mesh generated by generateMesh. Temperature values at the nodes appear in the Temperature property. The solution times appear in the SolutionTimes property. The three components of the temperature gradient at the nodes appear in the XGradients, YGradients, and ZGradients properties. The array dimensions of Temperature, XGradients, YGradients, and ZGradients let you extract solution and gradient values for specified time indices. To interpolate the temperature or its gradient to a custom grid (for example, specified by meshgrid), use interpolateTemperature or evaluateTemperatureGradient. To evaluate heat flux of a thermal solution at nodal or arbitrary spatial locations, use evaluateHeatFlux. To evaluate integrated heat flow rate normal to specified boundary, use evaluateHeatRate. 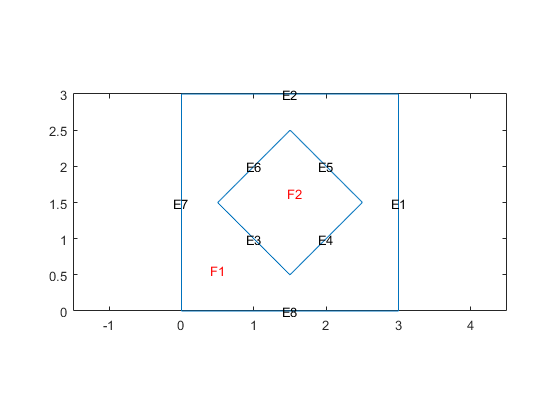 Solve a transient thermal problem using the solve function. This function returns a transient thermal solution as a TransientThermalResults object. Finite element mesh, returned as a FEMesh Properties object. Temperature values at nodes, returned as a vector or matrix. Solution times, returned as a real vector. SolutionTimes is the same as the tlist input to solve. x-component of the temperature gradient at nodes, returned as a vector or matrix. y-component of the temperature gradient at nodes, returned as a vector or matrix. z-component of the temperature gradient at nodes, returned as a vector or matrix. Solve a 2-D transient thermal problem. Create a transient thermal model for this problem. Create the geometry and include it in the model. Assume that the diamond-shaped region is a heat source with a density of 4W/m3. Apply a constant temperature of 0∘C to the sides of the square plate. Set the initial temperature to 0∘C. The dynamics for this problem are very fast. The temperature reaches a steady state in about 0.1 second. To capture the interesting part of the dynamics, set the solution time to logspace(-2,-1,10). This command returns 10 logarithmically spaced solution times between 0.01 and 0.1. 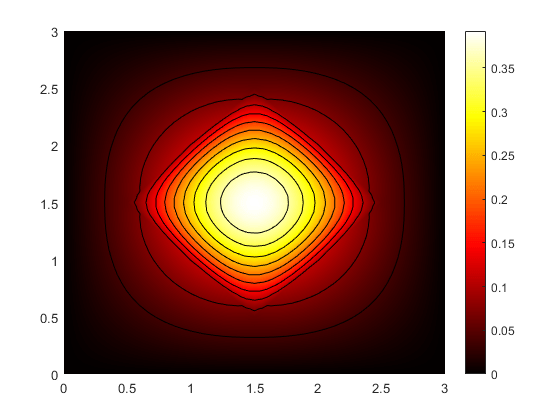 Plot the solution with isothermal lines by using a contour plot.